Review Summary: A fun but emotional album, nothing less. Tilian's newest outing as a solo artist is possibly the most solid effort he has put out thus far. It's an album that's fun for the sake of it but his raspy vocals show off how well he can generate emotion and send it straight to your heart. While it's not his most pop-rock induced endeavor, it certainly feels like a softer, more centered version of Instant Gratification. While it lacks some of the punch of Tilian's usual lyricism in Dance Gavin Dance, but it still manages to paint a picture in your head on what exactly inspired these songs. "Made of Plastic" starts the album off fairly simply, with the steady beating of drums and with Tilian's vocals fading into the background as he goes. The chorus shows off anthem-like guitars and some electronic sounds steadily moving in place with the drums as they pace up ever so slightly. "Cocky" was the first single to be released and it feels like a 90s rock song with a music video similar to this. This is one of the songs where Tilian's voice shines the most, as they are low for a majority of the song aside from the chorus, compared to the first track. It manages to grab you with the dance-like vibes radiating from just how well the guitars mesh with his voice. It's almost melancholic to a point, as he is speaking about how he had manipulated someone into loving him. "Gone" is the first slower song of the album, immediately slowing down the pace from the last two songs. It gives off a very "love lost" vibe but from the opposite end. While it's placed a bit early, it fits very well with the rest of the record, with a mesh of multiple sounds sinking slowly into the listener's ears. "Handsome Garbage" straight away feels like something that was scrapped from a DGD record and placed onto this, it's just missing Jon Mess' screams. Tilian's vocals are at their peak performance here, going low and soaring incredibly high, even becoming a bit more harsh once in a while. "Hold On" isn't great, however. While the lyrics are something that Tilian would certainly write, the instrumentation and pacing of it is nothing to really write home about. It's boringly slow even with the build-up that honestly feels as if it leads up to nothing. It sounds like any upbeat song you may here on the radio. "Blame It On Rock And Roll" is possibly the best song on this record. It immediately kicks off with energetic guitars with a relatively simple drum beat, but this makes it the most fun track. Tilian sings of his nostalgia and his life-long desire to become an artist, this all kicks into a bridge where Tilian sings as raspy as ever, and it shows how happy he is to be in this spot in his life. "Let Her Go" starts off with a fairly generic beat with Tilian's vocals echoing similar to the first track. It's not amazing as it's somewhat generic in terms of instrumentation, as it keeps the same beat that just so happens to speed up every now and then. "Drunken Conversations" is probably the track that has the most electronic influence and Tilian's voice stays relatively the same though it goes low with how they pitch it during each chorus. It's pretty okay filler. 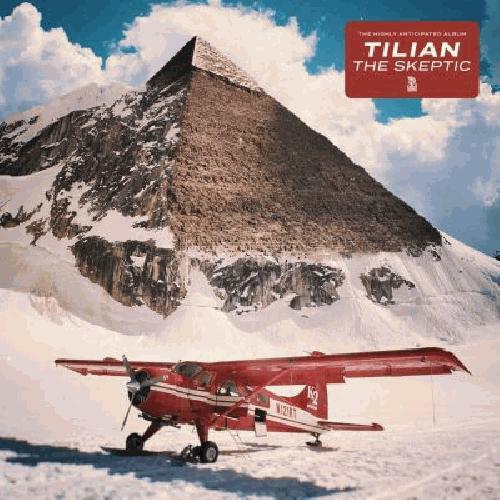 "Right Side" probably features the highest Tilian's voice can ever possibly go all with synchronized guitars and an atmospheric noise surrounding them, with little electronic influence seeping its way through into the verses. It'll make you feel out of breath by the end of it. "Ghost Town" ends the album with another pop influenced track, talking about how carefree Tilian has guitars and thumb-snapping jumps out during the chorus, showcasing that Tilian is only just getting started with his solo career. He's definitely coming off the high he had during Artificial Selection, and it will hopefully show in any future releases. For whatever reason, the album art will not show no matter what photo I use, though it is a decent size and a .jpg file. Apologies. My boi, Tilian already had a page under "Tilian Pearson"
If you edit an album's artwork many times before a mod can approve the changes, the site glitches and the artwork can't be fixed unless a mod does it. i was thinking about writing something for this as well.... i really liked the singles, it's a much better blend of pop and rock than his last album. can't wait to check the whole thing out. a few songs and it seems relaxing. would have to delve deeper to know. He's an amazing guitarist, he wrote and played most of the stuff when he was in ToM i believe, and their stuff is nuts. I had no idea Tilian wrote guitar parts in ToM. that's awesome. I'll get to this tonight since I'll be spending my day with the new Hail The Sun, but I'm really excited. I loved Cocky, Hold On was alright, but Ghost Town was really good even if it felt a bit too radio pop. Thank you to the mods for helping! And yeah HG is top tier. A lot of great stuff here but a lot of obnoxious pop-trope decisions. The last few songs minus Ghost Town all feel really bogged down because of these decisions mostly in their choruses which is a shame, because at their core, they're pretty good. Everything up until/including Blame it on Rock and Roll made me think this would easily be his best work despite a few meh ideas here and there. Cocky is easily the most solid of all of these. I'm a sucker for things like the "spoken word" or whatever you want to call it in Made of Plastic which was dope. Handsome Garbage would have fit on Artificial Selection if you wanted to add Mess to it. Really good song. Blame It On Rock and Roll needed some backing vocals or prominent "ohh's" in the chorus or something but it was still a jam. Happy with this overall. Definitely has higher highs than Perfect Enemy. It feels about the same as Material Me in that respect but that was definitely less obnoxious overall. Also, a slower ballad in the 2nd half would have rounded this whole thing out nicely.